There was a time when tracking game was half art, half skill. Famed trackers and hunters could seemingly follow an animal across any terrain by understanding their habits and being hyper-attuned to detail. Sadly, few of us anymore get to lead the kind of life that gives us the chance to practice and master such venerable skills, so we are reduced to admiring the legendary hunters of old. And science. We have science on our side. Humans are tool users, and we constantly invent tools to compensate for lack or loss of skills or simply for the fact that despite our advanced brains, we are not exactly the strongest, fastest, and most powerful creatures living on the planet. One such tool we’ve created is the blood light. Using advanced mumbo jumbo and technology salvaged from the Roswell UFO crash, we were able to create flashlights that make blood glow under certain conditions. Actually, that’s not true; it’s just fancy black lights (alien technology not needed). If you don’t track wounded game with these, you can use it at parties, or to get grossed out at that used van you were thinking about buying. Anyway, the 4 following products can each qualify as the best blood tracking light. Check ’em out (and after our reviews, we dive into what you should look for in selecting such lights). This is probably the most epic of all blood lights on the market and is priced accordingly. Using advanced 600 lumen Cree LED’s and an advanced filter to further enhance light output, this light all but makes blood jump out and attack you. Most any blood light can track big drops in easy locations, but if you want to be assured of tracking wounded game like Daniel Boone, you will not find any better blood light on the market. Be aware though, this performance comes at a price in the form of low battery life, and a dangerously powerful light (see full specs) that can injure eyes or even cause blindness if misused. Used responsibly, this light is a must have for any hunter and is easily the best blood trail light period. This is the one I keep in my pack when hunting deer. Both inexpensive and versatile, I’ve long trusted the Gerber name when it comes to knives and find this light to be very useful. With a simple button click, you can go from the primary light to a tracking light. Modern LED’s ensure a long run time on batteries, while the rugged rubber body will stand up to most anything you throw at it. Except bears: don’t throw this at bears or you’ll end up like you’re auditioning for The Revenant. A fantastic bargain and suitable for pretty much all your in the woods lighting needs. This might be the best blood tracking light for the money. This easy carrying and water resistant multipurpose blood tracking light is another great choice. 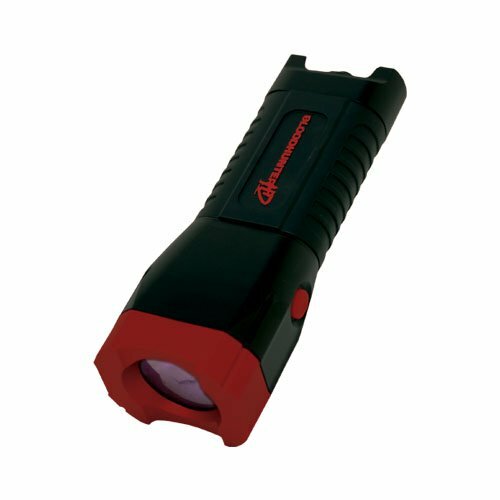 Built with a long lasting anodized aluminum body, and impact resistant up to seven feet, this three mode (white/red/blue lights) flashlight is a true do all flashlight. Available with multiple brightnesses from 18 to 180 lumen, you are bound to find a Rayovac Sportsman that fits your needs. I like this one a lot not only for the price (and hey, the included batteries are cool too) but also because it’s simple and to the point. A lot of lights are packed with gimmicks and needless fripperies that drive up the cost and increase complexity, but sometimes you just need a freaking light, and Rayovac gives you just that. The Primos Bloodhunter comes in a headlamp variety too. A headlamp is one of the easiest options for finding blood. When marching through thick woods it can be difficult to balance navigation, your weapon and a light. With the the Primos Bloodhunter Headlamp, there is no need to worry. Strap it on and take off. If you are using a dog, this is an absolute must have. The Bloodhunter is equipped with both a bright blue light for finding blood, and a white light for your normal hiking and map reading needs. The Bloodhunter Headlamp is lightweight, bright, and well-suited for the great outdoors. 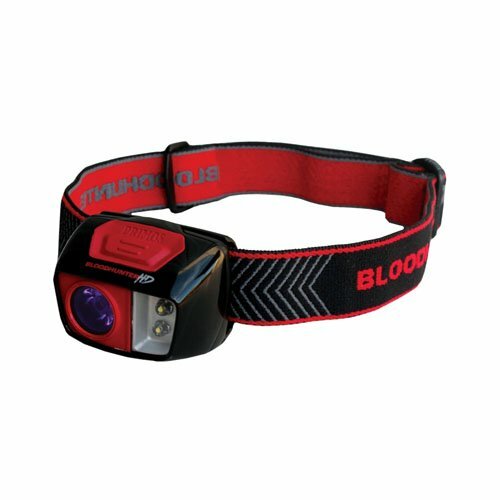 It should be on any list of the best blood tracking lights. Some think that UV lights are what is needed for illuminating blood, when the reality is UV lighting will only illuminate the freshest blood or blood treated with special chemicals. All well and good if you are starring in the latest prime time police procedural drama, not so much if you are a hunter with wounded game to track. Because bowhunting doesn’t always lead to a quick kill, tracking wounded game is an important part of the hunt, and various tricks have been used to help spot blood easier. An old standby is a high intensity Coleman gas lantern, but they are awkward to use, and could be a fire hazard in the forest. The advent of high powered LED bulbs changed all that though, and now most blood tracking flashlights either use an extremely high intensity white light, or a red/green mix or a specialized blue light. The trick in each case for the blood to absorb certain light spectrums and appear visible to the naked eye. Some lights and conditions will make blood almost glow, while in other cases it simply stands out against the dirt and leaf litter of the forest floor. Perhaps the greatest problem in picking the best blood trail light is finding out what works best for YOU. Some swear by brilliant white lights, others swear at them. 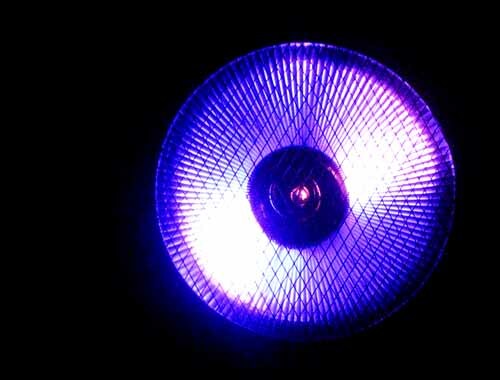 Others favor blue, while some still sit around grumbling about how back in their day we didn’t have these newfangled LED lights. Or electricity, and you had to hike three miles uphill in the snow to find your wounded game. To that end, I would argue that a multi-color light is your hands down best blood tracking light you can buy. When you have several different colors and brightness settings to work with, you are bound to find one that works best for you and your given situation. 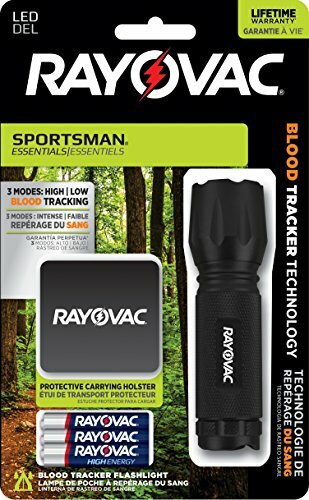 As an added bonus, you’ll find a good blood tracking light works well as an every day flashlight, so you really have nothing to lose by adding one or two to your kit!